We met almost eight years ago when a mutual friend introduced us at a holiday party. We exchanged Facebook info, and kept in touch from time to time. Then four years later, Riley commented on one of my photos from a Coldplay concert, and sent a message that he loves Coldplay too, and we should hang out next time there’s a concert. We made plans to attend a music festival together later that month, and it's all history from there. For our anniversary, we decided to go to Sandals La Toc in St. Lucia to celebrate, and Riley proposed, and I of course said “Yes”! Here we are now planning to return to Sandals La Toc to host our destination wedding! It's been an amazing ride, and we are looking forward to spending the rest of our lives together. We hope you will join us in celebration of our love. From the moment we locked eyes eight years ago, I knew Ava would have a special place in my life forever. I remember how awesome it felt that night when we met … we literally were introduced and spent the whole night standing in the kitchen area, just talking the night away. There was something about her, I knew she was the one. Unfortunately, soon after we met, I moved away for a job opportunity, but I kept in touch. When my career path led me back to my hometown, I was thrilled to reconnect with old friends, especially with Ava. I made my move through facebook, of course, and we have been together ever since. I am so excited to spend the rest of my life creating new memories. 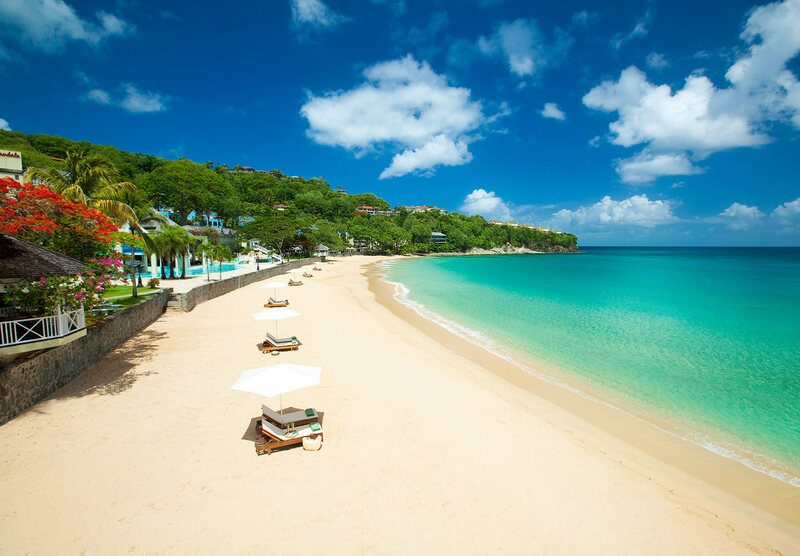 Sandals Regency La Toc is a magnificent 210-acre estate set on a half-mile, crescent-shaped beach, cradling exotic coral bluffs, lush hillsides and rolling fairways. Featuring a challenging executive-style golf course, stunning oceanfront suites and the private enclave of the Sunset Bluff Village, this resort is recognized as the most sparkling jewel in the islands. Indulge in Five-Star Diamond French cuisine and other international cuisines with access to 27 restaurants with the Stay at 1, Play at 3 exchange program. Lisa is not only my sister, but my best friend. I couldn’t imagine taking this next step in life without her by our side. Michelle was my teammate on the volleyball team all throughout high school. We bonded over the many hours of practice and tournament wins, and so glad to share this new chapter in our lives. Karen and I met freshmen year in college, and became roommates for the remaining three years and lifetime friends! We have so much in common, and had so many fun nights studying and hanging out around campus and in the dorms. Greg is not only my brother, but also my best friend. I can’t remember any memories growing up where we weren’t getting into trouble together! We had such a blast growing up, and I’m so honored to have him as my best man. Carl was my roommate all through college, and one of my best friends until this day. And if it wasn’t for Carl introducing me to Ava at that holiday party, we may not all be here celebrating our wedding today. I owe Carl big time for introducing me to the love of my life. Dominic is my cousin and practically grew up as a second brother to Greg and I. The jokester of the group, he’ll definitely have you in tears after 5 minutes. It was Dom that always made those long summer vacation road trips fly by.